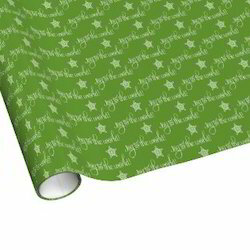 We manufacture Handmade Gift Wrapping Paper which is used for wrapping various gifts. Available in various colors and patterns, they not only look attractive but are also highly designer and durable. Cost effective and made using recycled paper, they easily decompose and are light in weight. Made by experts, they have been prepared in a unique manner. S. B. Packagings Pvt. Ltd. These Gift Wrapping Papers and Gift Slips offered by us are available in different patterns and colors for different occasions. These are offered in the standard sizes, which make them perfect for wrapping the gift of almost any size. These gift wrap papers are available in different kinds of papers as per the requirement of our clients.